of India. It is one of the holiest places of Lord Muruga and is situated 9 k.m. away, west of Tiruchirappalli city. St. Arunagirinathar in his Tirupugal poems (hymns). Transportation : Bus transport are available from Trichy Chathiram Bus stand, Central Bus stand and Trichy Junction (Railway station). The devotees are able to come from all parts of the country to Thiruchirappalli Railway Junction. 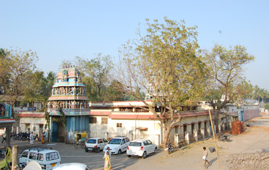 From there devotees can come to this temple by bus (city bus) or any other mode of transport. Visitors and devotees from foreign countries may arrive at Thiruchirappalli Airport and from there they can reach the temple by fetching any transport vehicle.